Edinburgh is a proud city. It is proud of its history, its status as Scotland's capital, and its relative prosperity. This is a city which takes its reputation seriously. That may explain why Edinburgh's ill-fated tram project arouses such intense emotions. Sadly, pride isn't one of them. Mention the word "tram" to passengers standing at a bus stop in Leith or Morningside and they are much more likely to express feelings of anger, frustration or dismay. Edinburgh has one of Britain's best bus services. It is regular and reliable and the buses themselves are mostly new and comfortable. But the city council was determined to build a tram network. Councillors and officials worried that the bus system would not be able to deal with population growth. Trams, they said, could carry far more people than the buses. And there would be less pollution in the city too. When work began, Edinburgh's elegant streets were transformed into a giant building site and initial scepticism was replaced by downright opposition. For years now, the city's tram project has lurched from crisis to crisis. It has routinely descended into farce. By the time this year's Edinburgh festival season arrived, it had become a full-blown fiasco. The problems have been caused by a bitter contractual dispute between the company set up by the city council to manage the project and the contractors who were actually building the line. Each side tried to force the other to pay for the extra work they discovered was needed as the project progressed. The electricity cables, phone lines, water mains, and gas pipes which lie beneath the tram route all had to be moved before the tracks could be laid. But the utility diversion work was much more complicated than anyone imagined. Contractors even found skeletons buried on part of the route. There were design changes too. Again, both sides argued over who should pay for them. Work was delayed, costs rose, and the resulting arguments led to stalemate. The Scottish Government eventually ordered both sides to go to mediation. 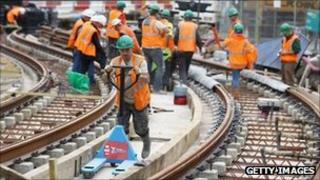 The result was a deal which allowed work on key sections of the line to restart. Inevitably, there were winners and losers. The city council's tram company, TIE, has now been scrapped and its executives have resigned. Meanwhile, the contractors, led by the German firm Bilfinger Berger, increasingly appear to have been vindicated. The company has described the row as "extraordinary", saying it has never experienced anything like it, anywhere in the world. The executives from TIE are staying silent. Scotland's finance secretary, John Swinney MSP, has claimed he was "repeatedly misled" by TIE about its handling of the contractual dispute. Meanwhile, Edinburgh City Council's transport convener, who was on the board of TIE, has told BBC Scotland he is not sure he had the skills he needed to oversee the project. The end result of the chaos? Edinburgh's tram "network" will now comprise only half of one line, stretching from the airport to the city centre. It was intended to reach the waterfront at Leith and Newhaven. There were to be other lines too. The latest cost estimate is £776 million. Far higher than originally claimed for the entire network. Interest payments will take the total to more than £1 billion. It is not just Edinburgh's pride which has been damaged by the tram fiasco. Its bank balance has been hit too. In an age of austerity, there have been claims the city council will have to cut other services to pay for the trams. The council denies that is the case. These days, there is an air of cautious optimism surrounding the project. Major challenges still lie ahead. But the peace deal hammered out in a series of late night negotiations may prove to have been a turning point. Things can only get better. They certainly cannot get much worse. Video Edinburgh trams: What went wrong?